In basketball, at what point does one team’s incompetence become a credit to the other team’s ability to provoke that incompetence? What separates bad shooting from good defense? 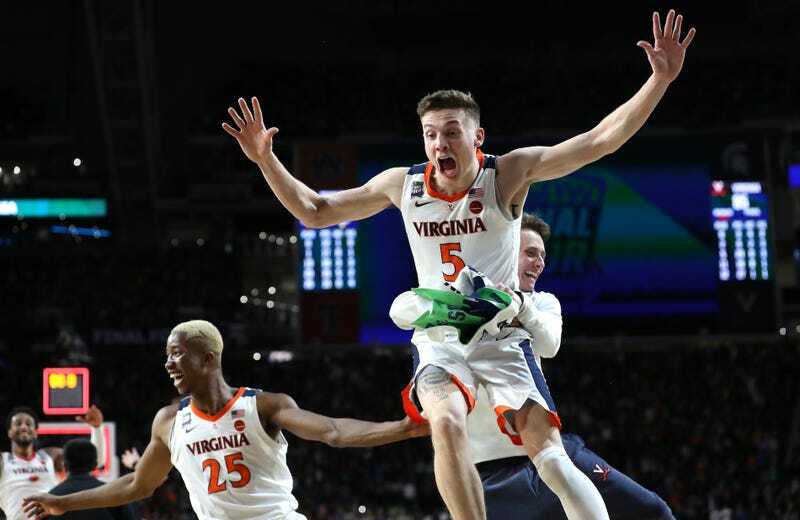 Well, the Virginia Cavaliers don’t need to ponder those questions right now, because their sludge style of play let them beat Texas Tech in the title game Monday night, 85-77. All the gripes about Virginia’s strategy have been made many times over and really peaked last year, when the Cavaliers, who were the slowest Division I team in the country in terms of pace, became the first No. 1 seed to lose to a 16-seed in the men’s tournament. Their tempo limits their number of possessions, which limits their ability to overcome a deficit, and that can make for ugly wins and uglier losses. But tonight, and throughout this year’s tourney, it succeeded. Virginia’s biggest lead of the game was 10, with 9:30 left in the second half, but just like they did against Auburn on Saturday, they allowed Texas Tech to come back late. With 22 seconds left in regulation, the Red Raiders took a three-point lead on Norense Odiase’s free throws. Then, De’Andre Hunter did this. That was a hell of a way to extend a title game that didn’t reach a total of 10 points until Ty Jerome’s three-pointer with 13:41 left in the first half. Both teams shook off the poor scoring expected from them, picked up their shooting in the second half, and got more comfortable from three. Neither team pulled away in overtime until a very ticky-tack call, after Hunter swatted the ball away from Texas Tech’s Davide Moretti. Officials reviewed the video and determined Moretti turned over the ball, even though he never made a second movement to try and touch it after his opponent smacked it. Only one top seed made it to the Final Four, but there were no buzzer-beaters or deep Cinderella runs in this tournament. That, along with a couple of helpful referee calls, kept things in Virginia’s favor. It’s shocking that the Cavaliers won a title, even though it shouldn’t be. This was a No. 1 seed, a team that went 30-3 in the regular season. Perhaps it was because of all the previous instances where a clearly inferior opponent took advantage of their style of play. They always seem on the edge. But because of the lack of upsets this year, the Cavaliers were able to prepare against known teams that were somewhat familiar to them. The surprises were kept to a minimum. The Cavaliers stuck to their plan, even if it hamstrung them last year and ended in humiliation. They made sure it wouldn’t happen again.